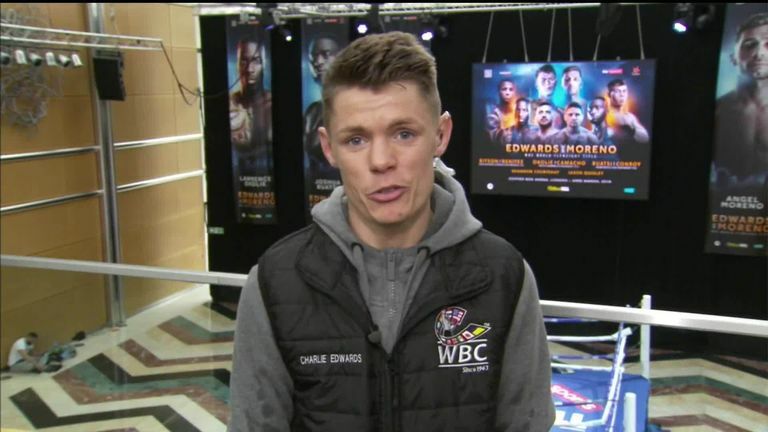 Charlie Edwards says he is a "different animal" after winning the WBC title and intends to take the first steps towards becoming a "British great" by defeating Angel Moreno. "Angel Moreno is a top class, world class fighter," said Edwards. "I've shared many rounds with him in the gym, and he is very tough. I wouldn't be surprised if it went the distance, and I'm fully prepared for the distance. My record doesn't say I'm a puncher, but in my last fight you seen that I kept Rosales off and you could see what an animal he was, so I must have been gaining respect. "But then again, I wouldn't be surprised if I get him out of there. I'm a completely different animal now. I'm planting when I'm hitting my punches. "My record doesn't say I'm a puncher, but in my last fight you seen that I kept Rosales off and you could see what an animal he was, so I must have been gaining respect. "Either way, I won't be surprised, but I will say it's going to be a Charlie Edwards win." Edwards has previously spoken of his desire to move up in weight, with British rival Kal Yafai holding the WBA belt at super-flyweight, but is wary of the threat posed by Moreno as he starts his title reign. "My dreams in this sport was always to be a British great, to be a multi-weight world champion," said Edwards. "These are the first steps I've got to take, and every fighter, I have 120 per cent focus on. "He's a tough man, he's going to try and be awkward, try and be rough, get up in my face. It's going to be a great night and I'm going to put a performance on for everyone on Saturday night." Moreno has previously traded punches with Edwards in sparring and warned the British fighter to expect a punishing encounter. On Saturday, when I win the world title, don't leave Charlie aside as a broken toy, because he has huge potential. "We will have an amazing fight, and I know that the one who comes through the end of the fight with the belt will have gone through hell, because it's going to be the fight of a lifetime," said Moreno. "On Saturday, when I win the world title, don't leave Charlie aside as a broken toy, because he has huge potential. Keep on supporting him, even when I become the champion on Saturday night."